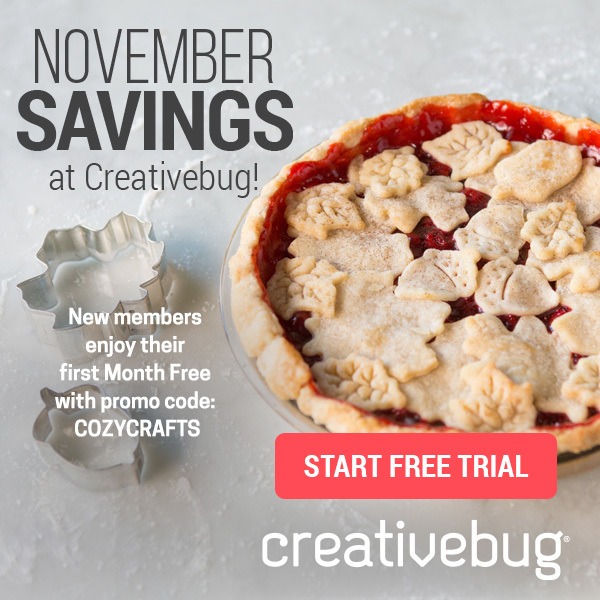 FREE TRIAL THIS NOVEMBER WITH CREATIVEBUG. This post contains affiliate links. This means that if you purchase through them I receive a small commission. Please note I only link to companies I love and use. Creativebug is one of them. Hey. Happy Friday. I just wanted to pop in and let you know that Creativebug have a fantastic offer on at the moment for a months free trial for new members. If you've been on the fence about whether or not to try it now is a great time to sign-up. Creativebug is packed full of awesome online classes. You can learn how to make the perfect pie crust, knit a scarf or my personal favourite learn how to crochet to a rag rug. They've got some really lovely Holiday craft tutorials as well, I love the diy painted gift wrap. It normally costs $4.95 a month but if you click on the link below and use the code COZYCRAFTS when you sign-up new members can get a months free trial.